UPDATED: Sun., Feb. 25, 2018, 10:25 p.m.
Teaira McCowan had 20 points and 20 rebounds to match a career high, Victoria Vivians added 18 points and No. 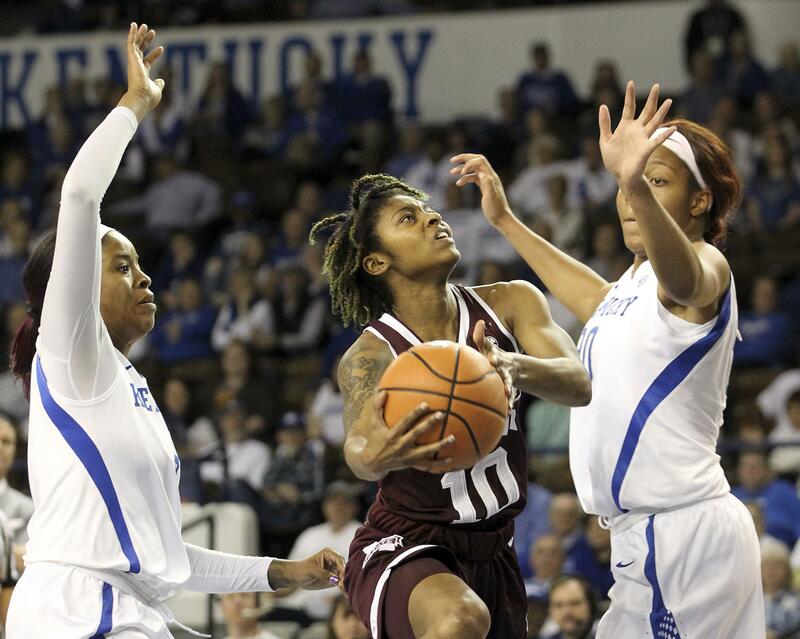 2 Mississippi State routed Kentucky 85-63 on Sunday in Lexington, Kentucky, and become the first Southeastern Conference team to finish the regular season unbeaten in 20 years. The Bulldogs (30-0, 16-0 SEC) matched Tennessee’s milestone in 1997-98 after erasing a 9-3 deficit with a 14-4 run led by 3-point shooting. The 6-foot-7 McCowan then took control inside on both ends of the floor before Vivians warmed up offensively. Maci Morris scored 16 of her 22 points in the first half for the Wildcats (14-16, 6-10), who had won two of three coming in. (4) Louisville 81, Pittsburgh 49: Asia Durr scored 20 points, and Louisville claimed its first regular-season conference title in 17 years with a win over Pittsburgh in Louisville, Kentucky. Hines-Allen finished with 18 points and 16 rebounds for 43rd double-double of her career. The Panthers (10-19, 2-14) used a 10-2 run midway through the third quarter to get within 12 points, but Louisville ended the period on an 11-1 run to put the game away. (5) Notre Dame 88, (21) N.C. State 67: Jackie Young shed a mask protecting a broken nose and scored 22 points to lead four players in double figures, and Notre Dame closed out the regular season with its 12th straight victory, over North Carolina State in South Bend, Indiana. (15) Tennessee 65, (7) South Carolina: Rennia Davis had 18 points, 10 rebounds and four assists and Tennessee rallied on its home court in Knoxville, Tennessee, for a victory over South Carolina – playing without star center A’ja Wilson. Wilson, a national player of the year candidate, didn’t make the trip to Knoxville due to vertigo. Mikiah Herbert Harrigan started in the Southeastern Conference scoring leader’s place and had a team-high 17 points in the regular-season finale for both teams. Mercedes Russell added 16 points and 12 rebounds for Tennessee (23-6, 11-5). Without Wilson, South Carolina (23-6, 12-4) had its highest turnover total (21) and lowest point total of the season. (8) Oregon 74, Arizona 61: Ruthy Hebard scored 24 points and Oregon clinched its first Pac-12 regular-season title in 18 years with a victory over Arizona in Tucson, Arizona. Oregon (27-4, 16-2 Pac-12) won 24 games last season and took a big step this season, breaking school records for overall and conference wins. The Ducks closed the regular season with six straight wins and 10 of 11 to earn their first Pac-12 title since 1999-2000. Sabrina Ionescu finished with 16 points, eight assists and seven rebounds for Oregon. Lexi Bando had 15 points and hit consecutive 3-pointers to turn back a late Arizona surge. Arizona (6-23, 2-14) kept up with the high-flying Ducks and made a late run, but came up short. Freshman Sam Thomas had 17 points to lead the Wildcats, who closed the regular season with six straight losses. (9) Florida State 64, Georgia Tech 61: Shakyala Thomas scored 19 points, Chatrice White had her sixth double-double of the season and Florida State rallied in the fourth quarter to defeat Georgia Tech in Tallahassee, Florida. The win gives Florida State (24-5, 12-4 Atlantic Coast Conference) a double bye in this week’s conference tournament. Georgia Tech (17-12, 6-10) had a chance to send it into overtime, but Pan’s 3-point attempt hit the back of the rim. (17) Texas A&M 82, (11) Missouri 63: Anriel Howard turned in her sixth straight double-double and became Texas A&M’s career and single-season rebounding record-holder as the Aggies beat Missouri in College Station, Texas. Howard had 16 points and 10 rebounds for 923 boards in her career, passing Prissy Sharpe (920 from 1996-2000), and 360 this season, tying Peggy Pope (1978-79). Chennedy Carter scored 23 points and Danni Williams 20 for the Aggies (22-8, 11-5), who finished in a four-way tie for fourth place with Missouri (23-6, 11-5), LSU and Tennessee in the SEC. (12) Oregon State 64, Arizona State 60: Marie Gulich scored 30 of her career-high 36 points in the second half and Oregon State rallied to defeat Arizona State in Tempe, Arizona, and secure a first-round bye in the Pac-12 Tournament. Gulich was 16-of-18 shooting, including all 13 of her shots in the second half as the Beavers (23-6, 14-4) overcame a 10-point halftime deficit with a strong third quarter. Gulich made seven shots and both her free throws in the third quarter to help OSU take a 45-43 lead. She made six shots and two free throws in the fourth but it was Katie McWilliams who secured the win with two free throws with 13 seconds left. The Beavers shot 74 percent in the second half and 62 percent for the game. Arizona State shot 32 percent in the second half, 37 percent for the game, but had a 14-4 advantage in offensive rebounds. Robbi Ryan and Sophie Elenga had 13 points apiece for the Sun Devils (19-11, 10-8), who play Thursday in the opening round of the tournament in Seattle. (13) Maryland 77, Nebraska 75: Kaila Charles had 19 points and 11 rebounds, Stephanie Jones had the go-ahead free throws and a huge block with 13.9 seconds left and Maryland held on to defeat Nebraska in College Park, Maryland, to secure the second-seed for this week’s Big Ten Tournament. Hannah Whitish put Nebraska on top for the first time since the opening minute 75-74 with a 3-pointer from the right corner on an inbounds play with 48.7 seconds to play. On Maryland’s possession, Jones grabbed an offensive rebound and was fouled at 26.3 seconds. After Jones made both free throws she came up with a block on Jasmine Cincore’s drive and grabbed the loose ball. Following a timeout, Charles made 1 of 2 free throws. The Cornhuskers had 13.2 seconds but Whitish’s 3 was off the rim as time ran out. Eleanna Christinaki had 13 points for the Terrapins (23-5, 12-4 Big Ten). Whitish had four 3s and 14 points for Nebraska (20-9, 11-5). (14) Ohio State 89, Penn State 64: Kelsey Mitchell scored 22 points to become the No. 3 scorer in NCAA history and the nation’s leading double-double duo, Stephanie Mavunga and Linnae Harper, did it again as Ohio State rolled past Penn State in University Park, Pennsylvania, to clinch the outright Big Ten regular-season title and the No. 1 seed to the conference tournament. Mitchell’s 3,286 career points moved her past former Baylor star Brittney Griner (3,283). The Buckeyes (24-6, 13-3) led early on and by 15 at halftime. The lead reached 26 points after three quarters to a high of 38 in the fourth. Teniya Page scored 19 points and Jaida Travascio-Green 17 for the Lady Lions (15-14, 6-10). (16) Stanford at Washington State, canceled: The women’s basketball game between No. 16 Stanford and Washington State scheduled for Sunday in Pullman, Washington, was canceled after the death of the Cougars’ director of strength and conditioning David Lang. Lang, a longtime member of the athletics department, worked directly with the women’s basketball and men’s and women’s golf programs. Stanford (20-9, 14-3) entered the day a game behind No. 8 Oregon for the Pac-12 Conference championship. The Ducks clinched their first regular-season title in 18 years with a 74-61 victory over Arizona, which is 11th in the conference, on Sunday. (19) Georgia 63, Florida 43: Senior Mackenzie Engram and freshman Gabby Connally each scored 12 points and Georgia beat Florida in Athens, Georgia. Georgia (24-5, 12-4 Southeastern Conference), which was picked eighth in the SEC preseason poll after a 16-15 finish last season, has only lost to teams currently ranked in the Top 25. Caliya Robinson added 11 points and Taja Cole 10 for Georgia. Funda Nakkasoglu was the only Florida (11-18, 3-13) player in double figures with 10 points. (20) Duke 70, North Carolina 54: Rebecca Greenwell tied her career-high with 31 points, Lexie Brown added 22 and both had double-doubles to help Duke secure the fourth seed for the Atlantic Coast Conference Tournament with a win over rival North Carolina in Durham, North Carolina. Greenwell hit seven 3-pointers for the Blue Devils (22-7, 11-5) and grabbed 13 rebounds, one short of her career high. Duke, up by two at the half, scored the first 15 points of the second half, nine by Greenwell, to break the game open. Greenwell had 15 points in the quarter that ended with the Blue Devils up 56-36. Jamie Cheer scored 20 points for North Carolina (14-15, 4-12). (22) Green Bay 88, Detroit 45: Jessica Lindstrom and Allie LeClaire, the only two seniors for Green Bay, combined for 37 points and the Phoenix coasted to a win over Detroit in Green Bay, Wisconsin. Lindstrom had 19 points and 14 rebounds for her 16th double-double of the season and 39th of her career. LeClaire added 18 points and surpassed 1,400 for her career. The seniors had seven points apiece in the first quarter when the Phoenix (26-3, 16-2 Horizon League), who won their fourth straight with their highest scoring game of the season, had runs of 7-0 and 11-0 en route to a 25-13 lead. Nicole Urbanick led the Titans (2-27, 2-16), who have lost four straight, with 17 points. (24) LSU 79, Alabama 78 (OT): Ayana Mitchell scored a career-high 27 points on 11-of-13 shooting with 12 rebounds and a game-saving blocked shot with a second left and LSU defeated Alabama in overtime in Baton Rouge, Louisiana. Chloe Jackson led the Tigers (19-8, 11-5) with 31 points. The Crimson Tide (17-12, 7-9) is the eighth seed. Hannah Cook contested jumper to the right of the lane put Alabama up 70-68 with 3.5 seconds left in regulation. The Tide committed a non-shooting foul with 1.9 to go before Khayla Pointer inbounded the ball deep to Mitchell in the lane for the turnaround tying shot with less than a second to go. Cook led Alabama (17-12, 7-9) with 18 points. Published: Feb. 25, 2018, 10:21 p.m. Updated: Feb. 25, 2018, 10:25 p.m.